Crimlin Batafada Pipeband Enjoys a Successful Trip to The Europeade Festival in Gotha, Germany. 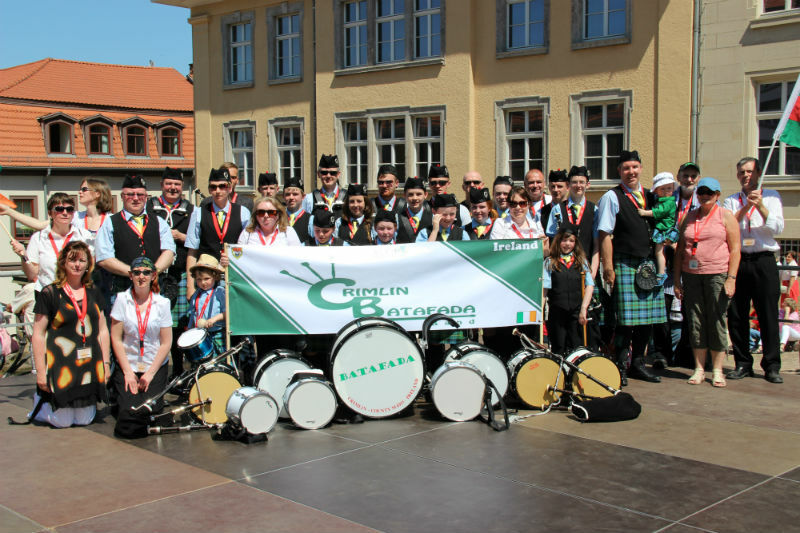 Crimlin Batafada Pipe Band recently represented Co. Mayo and Ireland at the 50th Europeade Festival which was held in in Gotha Germany from the 18th to the 21st of July 2013. The Band who are the reigning Fleadh Cheoil na hEireann Pipe Band Champions performed at 11 events over the five days of the festival. The Crimlin based outfit also participated in the Europeade parade on Saturday the 20th of July where an estimated 50,000 spectators cheered on the 4,300 musicians and dancers from 198 regions across Europe. The band not only performed as a Pipe Band but had Irish dancers and traditional musicians who also provided entertainment at the festival. Dubhdara a talented traditional Irish music group who are also members of Crimlin Batafada Pipe Band performed to over 15,000 people at the Europeade Ball. The band received a huge welcome in Gotha and even appeared in the local press. Europeade is the largest folk festival of its kind in Europe and is hosted by a different country every year. The band which is based in Crimlin outside Castlebar are always looking for new members anyone interested in joining the band and should contact batafadaband@gmail.com. From Europeade 2013 in Germany to Ireland in 2004. Check out these Europeade links for photos of the Europeade parade held in Castlebar back in 2004. Europeade in Castlebar 2004 - St Pats photos. Europeade Parade 2004 from Kellehers Corner. Our Europeade Front Page on 27 April 2004.